» Forum » Market » Buying and selling advice » Hoops or Genesis? I have the opportunity to purchase either game, for almost equal prices. What are the pros and cons of each and which is the better buy. I'm leaning towards Hoops because of the rarity. Any thoughts? Genisis is pretty dumb but has some good things going for it; namely the recockulus MB multiplier that can get over 40X. It's main issue is it's the choppiest wood chopper ever. The 2 main ramps slow the game down quite a bit, every time you hit one the game stops, makes some noises and flashes some lights, and then kicks them out. You have to hit the ramps all the time so it really adds up. 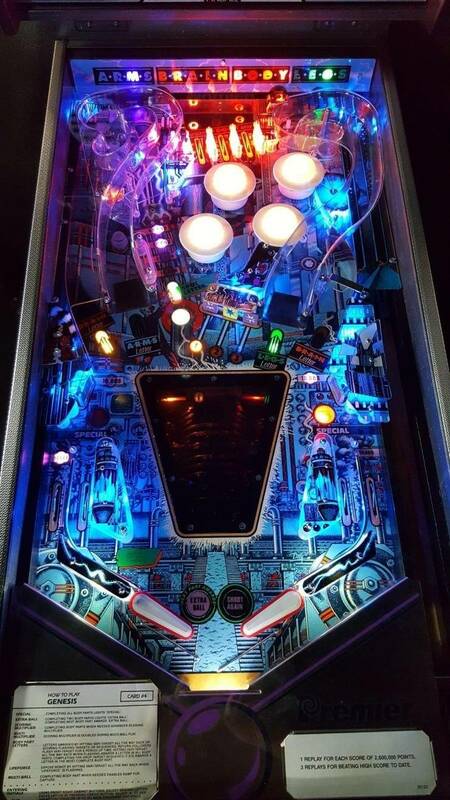 Has the cool Gottlieb kicker targets and the actual backglass is cheesetastic in a fun way, unless it's one of the lame ones people put in to act like it' a classy game (it is not). I can;t imagine heading to play this game everyday if I owned it...not for more than 2-3 weeks. It's a fun change of pace every once in a while. Have never played Hoops but have a Genesis and its not the greatest choice for a small collection but its a pretty fun game when dialed in and working correctly, I doubt I would ever sell mine, I got it for cheap and bought a new plastic set and ramps from Freeplay40. I played hoops several years ago, I played Genesis recently so take the following with a grain of salt. I've always had a soft spot for the street level Gottlieb games, they always had some really interesting playfield designs. Hoops definitely has an interesting layout, with some unique feeling shots, and I remember there being a lot to shoot for. I don't remember the rules so much, so I don't recall if all those shots are actually worth shooting, but I do remember being able to relock balls in multiball for a nice bonus. I thought that was cool. Lends weight to the mode. Genesis was a delightful surprise. I agree, it's a bit of a woodchopping adventure of a game, since you have to make certain target shots a million times to complete a single body part, but it's got a fun vibe to it, and most importantly, the rules have meaning to them. You get a nice little surprise for completing the game: you get to see what's in that coffee can below the playfield. I think for me, I'd buy the hoops, play it for a while, and see if it's got some cool surprises up its sleeve. Since it's a pretty rare game, you won't see them often, and you may never really get the chance to own one again. If it turns out to be a stinker, I'd sell it and buy a Genesis. You see Genesis a lot, and I doubt you'd be hard pressed to find one later to buy. Buy the Genesis then hook me up with the seller so I can buy Hoops. I've been looking for one. Get Genesis hoops can became boring fast in a home collection because the only thing you do in the game is light your hangetime spinner then you just shoot the spinner over and over. For some that's all you need. That's OK with me actually. I'm an old school guy. Either game would be the "newest" pin I ever bought and I only ever had one multiball game before, which was F2K. I'm surprised with all the love Genesis is getting in the poll. I guess not many people have played Hoops. For you guys not familiar, Papa has a video of the gameplay available here on Pinside. It's a pretty neat, different game. I would get the Hoops, there was one on DE Craigslist a couple years ago but the guy never got back to me. Definitely much harder to find than Genesis and also will be easier to sell if you change directions. I'm surprised with all the love Genesis is getting in the poll. It has ramps, thus makes Pinside happy. I choose Hoops personally but I get why Genesis is winning. Music/sounds/light show is definitely better. Replacing the stock crappy purple ramps with the new clear ones, (as well as the translite,) elevates the “cool” factor for many. I played a really nice looking and working deadly weapon and it looks pretty boring with single level and no ramps but was alot of fun, if I ever found one for a good price I would pick one up, im not a huge basketball guy but it could be fun, I just have never played one, I wouldn't mind getting my hands on a Title Fight, I also like the system 80bs and the street level Gottliebs for what they are. Genesis. Great light show, sound, and oddball theme. Fun to play. Hoops is absolutely awful in every way. Some of your fellow high level players love it though, Levi. Is it a stretch to say you are not a fan of any of the Street Level Gottliebs? Genesis used to be trash that nobody wanted because it was ugly. That was until people found out it's a great game. Some of my fellow high level players like huffing glue too! Silver Slugger is ok. But generally, no. They suffer from the same terrible software all those System 3 games have. Man they love a mystery award over there! Genesis is much better than Hoops. I can see where one would go with Genesis from a game play perspective, but if you pick it you have to find an alternate translite. My gosh the original one is bad. I love Genesis. Neat art packaged on the playfield, fun chiptunes and sound effects, and it's a fun and simple game. Hoops by a mile. The Sanctum in CT had both and guess which one stayed? Hoops. All the tournament players love it, and it has a separate score counter for basket points only, which keeps things interesting if you decide to mix up the play. This thread is fantastic and beats the pants off another "should I buy Pirates of the Caribbean or Iron Maiden: Legacy of the Beast (Pro)?" Or " Dialed In vs. Total Nuclear Annihilation ...what should get my $$?" OP - let us know what you decide and then send pictures. You want a winner? Show us a nice poll. The game looks very sharp with those clear repro ramps. Played both. Love genesis, hoops I didn’t really enjoy.